When was the last time you felt truly relaxed? We’re not talking the time you binged watched an entire series in one sitting whilst indulging in your favorite comfort foods, or the time you listened to your favorite podcast on a surprisingly smooth commute into work. We’re talking about proper relaxation — the mentally active process where you focus your mind and body and enter into a relaxing, meditative state. Today, our lives are hectic. Jobs, families and work — they all take up precious time and can cause a significant amount of stress. Taking the time to really indulge yourself, unwind and rejuvenate may feel like a distant pipedream, but relaxation is integral to your mental and physical wellbeing. When you’re relaxed, your heart rate and breathing slow, your blood pressure drops and stabilizes and your muscles loosen. Achieving a deeply relaxed state can also reduce your stress levels, boost your immunity and increase your energy levels and productivity. With these benefits, it should be a priority for all of us. 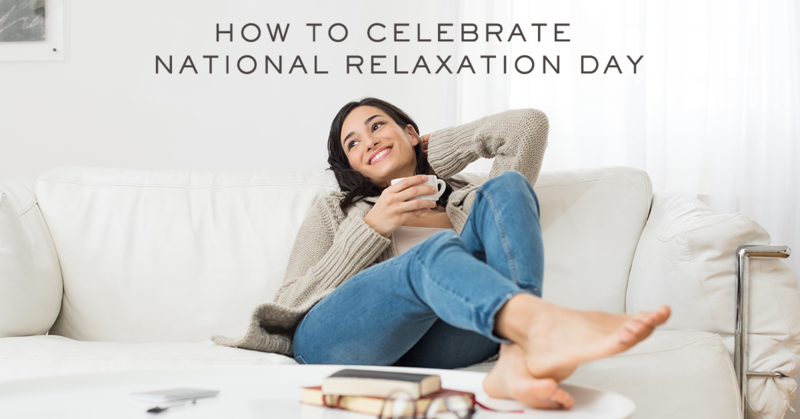 In honor of Relaxation Day on August 15th, we delve into the perfect ways to spend the day specifically created for ultimate relaxation. Try all or just some of these techniques and restore a sense of peace and tranquility in your otherwise stressful life. What’s the first thing you normally do in the morning? Catch up on your emails? Go through your to-do list? Jump straight into your tasks for the day? No wonder we’re all so stressed and worn-out. From the minute we wake up, our minds go into overdrive and it takes its toll. This Relaxation Day, give your mind a break and start the day with some calming meditation. Meditation is the practice of letting go to recharge a frazzled mind. By centering yourself and setting aside all your daily worries and thoughts, you enter into a space of clarity and simplicity, providing a very welcome break for the mind. And it’s easy to do. All you need to do is find a comfortable position — sitting, standing or even lying down — whatever works for you. Concentrate on your breathing and let all of your other thoughts melt away into the background. It’s completely normal to get distracted and feel thoughts creep in. Don’t berate yourself for it: just acknowledge them, let them go and bring your attention back to your breathing. For those new to meditation, don’t be frustrated if you can only do two or three minutes: it’s a great start. Like all things, meditation gets easier with practice. Give it a go and see for yourself the drastic difference a little moment of peace in the morning can make to your whole day. Relaxation doesn’t mean spending hours in solitude in the confines of your home. Many of us already spend too much of our time cooped up inside, whether in our homes, offices or schools. We spend our lives drifting from one artificially lit location to another and it can leave us feeling disconnected and out of touch with the world. Getting outside and amongst the greenery is one of the best ways to relax. Not only does natural sunlight help to regulate our sleep patterns, but it also provides us with a boost of Vitamin D: the so-called “sunshine vitamin” proven to lift our moods and help fight depression. Even the soil we walk on helps to increase our serotonin — the happy hormone — levels. Take to your nearest park, forest or even your back garden and spend some time unplugging from the daily grind and reconnecting with nature. Humans are a social species. We crave the company of others and value friendships above all else — it’s in our DNA. Research shows that friendships are integral to living a healthy life and that loneliness can be a silent killer. Your friends can help you to deal with stresses and difficulties in your life, provide support and a shoulder to cry on, provide light relief and, overall, make your life more purposeful and fulfilling. But, between work, family, partners and other commitments, it can be difficult to find the time for those special people in your life. On Relaxation Day, why not schedule some time to have a proper catch up with your friends? Put it in the calendar, arrange childcare, if you need it, rejig some appointments and don’t allow yourself to make up any excuses. On this day, your friendships come first. If you’re going through a tough time, open up to your friends and ask for their advice and guidance. Have a catch-up and a giggle and enjoy your time together. Laughter is a universal cure: when you laugh, your brain releases powerful chemicals that lift your mood and make you happy. If a trip to a massage therapist is too costly or time-consuming, a home massager is a great alternative. Simply wrap a personal massager around your shoulders and embrace the heat as it sends you into a relaxed state. There’s no better way to end the day than enjoying a hot, foamy, bubble bath. A good old fashioned bath isn’t just a decadent way to indulge in some “me-time” — it also has proven health benefits. Research has found that warm water helps to decrease stress and diminish feelings of anxiety, whilst reducing blood pressure and boosting immunity. To take your bath time ritual to the next level, try added essential oils to the mix. Rose, lavender and chamomile are all gorgeous scents that can clear your mind and put you into a deep state of relaxation. Close the door, light some candles, put on some music and lie back. The warm water will prime you for a restful sleep, so that you feel totally rejuvenated the next day. Wow!!!! Nice article, my friend suggests this site now I will visit regular here. Looking for Buy Forex Online in Delhi, India. Money Changing is dealing forex services at best exchange rates. Visit our website to know more about any forex services. Wow nice Article, i will definitely follow Activities.